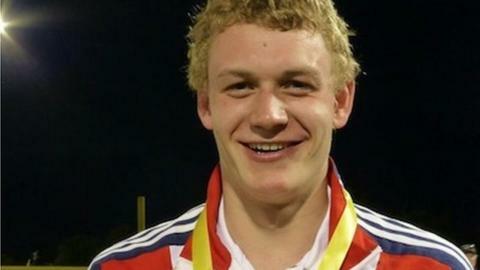 Britain's Joe Evans took bronze in his first Modern Pentathlon World Cup event in Palm Springs, United States. The University of Bath student, 19, finished only eight seconds behind Russian world champion and world number one Alexander Lesun, who took gold. Olympic bronze medallist Adam Marosi of Hungary took silver, while Britons James Cooke and Samuel Curry finished 18th and 23rd respectively. Heather Fell was ninth in the women's event, with Kate French in 19th. "The result is absolutely amazing," said Evans. "I'm so pleased. I knew I was in third on the last lap of combined event and I just kept running, I didn't even look behind to see where [fourth-placed] Ilia Frolov was. I had an excellent shoot as well. I only missed four shots. "Now I'm going to do more hard training in Bath and I'll wait and see if I get selected for the World Cup in Rio." Modern pentathlon - comprising fencing, horse riding, swimming, running and shooting - was under threat as a future Olympic event until the International Olympic committee decided to drop wrestling instead. Lesun had a flawless round of shooting and never looked like letting the gold medal leave his grasp during the combined event. He started the day in vintage form, finishing fourth in the fencing behind Dmytro Kirpulyanskyy of Ukraine, who won with 25 victories. The Russian followed up this respectable result with a 14th place in the swim, but it was his near-perfect ride worth 1,156 points which put him in third position ahead of the combined event. Shropshire's Evans, competing in his first senior event, was only five seconds behind Egyptian Amro El Geziry in the riding event of the combined, sealing his bronze medal position.